EDUCAUSE is so much more than an annual ed tech conference. It’s the premier gathering of IT directors, CIOs, disrupters, and AV managers on the leading-edge of education technology. Not only does the event provide a convenient place to test drive new gear germane to pedagogy, the event informs best practices and user manuals for colleges and universities worldwide. The show just ended in Orlando, but the conversation will stay alive with on-demand webinar viewing via educause.edu. Here are 14 companies that used the EDUCAUSE exhibit hall to showcase new and notable campus tech. Highlights: AMX by Harman shared advancements in collaboration and conferencing, classroom control, and wireless. Lane Shannon, Managing Editor of Marketing Communications, emphasized the company’s focus on AV for an IT world, as well as smarter apps and integrated campus systems. "We have made several new updates to our Campus Explorer Education App to integrate more of our technology,” he said. What's more, the new AMX Education Website has been completely redesigned, "like our Commercial End User Website, to guide Higher Ed decision makers through the often difficult to navigate 'Learn – Plan – Buy—Support' stages of the solution purchasing process,” Shannon added. Also on display were enhancements such as Screen Mirroring as part of the Enzo Content Sharing Platform, and new Massio ControlPads. Automated vignettes showed how products like Enzo support BYOD users. Highlights: Canon is lauded for its document imaging and short-throw REALiS LCOS projector lines (really effective in rooms with high-ambient light and space constraints). The company also used the EDUCAUSE spotlight to demo asset and media management solutions, mobile printing for BYOD, and content capture solutions. Highlights: The Christie Brio was at the head of the class at company’s booth. Christie Brio solutions are “huddle room” like in nature, capable of connecting classmates, research teams, lab groups and online course participants to share, discuss, learn, and leverage digital content. Christie’s Melody Song explained that the Brio platform is available in three different versions: Brio Team, Brio Team+, & Brio Enterprise. Brio Team features integrated Wi-Fi, AirPlay, and WiDi receivers, while Brio Team+ adds HD video sources to local session content and displays original video content at native resolutions through wired video inputs. Song added that the Brio Enterprise is an ideal for secured collaboration and sharing content between multiple campuses. Christie also presented its QuadHD84 at 60 Hz, 84-inch LCD panel featuring Quad HD resolution (3840 x 2160); the Christie FHD651-T 65-inch LCD panel; and impressive Christie MicroTiles (which are currently in use at Stanford University). Highlights: A bedrock tenant for Cisco is providing secure, scalable wireless networks that support multiple devices for anytime/anywhere data access. The company also believes in the ability to provide lecture capture, video collaboration, and asset management "at scale.” More and more colleges and universities are using Cisco WebEx to collaborate vis-a-vis distance learning and flipped learning. Cisco also showed off new developments in cloud computing and services, network infrastructure, virtualization, and wireless. Highlights: AirMedia, Fusion 10, DigitalMedia, and the 3-Series Processor were in the spotlight at the Crestron booth. The DigitaMedia (DM) system is an end-to-end solution for everything on campus—from BYOD to classroom control to auto scaling to 4K playback (no additional scalers required). The 3-Series platform is an integrated building management platform that is capable of unifying the various technologies within a commercial building to operate as a single system. Regarding the Fusion 10, Bill Strupp, DMC-D-4K, Market Development Manager at Crestron, said that it offers a "true management platform" with robust reporting, analytics, and metrics. School tech managers can use Fusion 10 to manage everything from lecture capture, instant diagnostics, energy efficiency, and database management. Highlights: The BrightLink 595Wi took center stage at the Epson booth. The 3LCD, touch-enabled, interactive projector was designed for K-12 and higher education and makes user-friendliness a priority. It is an ultra-short throw projector with WXGA res for widescreen, 3,300 lumens of color brightness, and 3,300 lumens of white light brightness. It offers diverse connectivity options, interactivity over the network (no PC required, yay), and Moderator software for BYOD. It can turn just about any flat surface into a collaboration space. 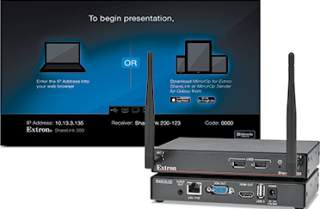 Highlights: New from Extron is the BYOD-ready ShareLink 200 Wireless Collaboration Gateway. It enables anyone in an education application to present and share digital content. It supports simultaneous display of presentations, images, documents, and other content from up to four different personal devices, eliminating the need to constantly change sources during an event, presentation, or lecture. Highlights: Not only can your school use Google for email, docs, storage, collaboration, screen-casting, innumerable Chrome apps & ingest widgets, Google is now offering its very own LMS. What’s next, self-driving cars? Oh, right. I’m still cautious about that little thing called privacy, though. Highlights: Open source video? Absoutely. Kaltura wants to offer customizable video solutions for every user need—entry-level to end-to-end video distribution and asset management. Great for BYOD with intuitive content capture. Highlights: Oracle’s new Student Cloud (announced in the Spring) as well as customer success stories were integral to the company’s mission this year. Oracle Student Cloud was created to meet the needs of customers who are transforming their institutions to support configurable standard business processes and to free up IT resources. Highlights: When it comes to campus video, it doesn’t get any more comprehensive than Mediasite by Sonic Foundry. Its user base in higher ed continues to grow as tech managers and end-users look to more secure and scalable video solutions and lecture capture. One of the EDUCAUSE 2014 takeaways was deeper integration with the learning management system Canvas by Instructure. With the ability to launch My Mediasite from within Canvas, faculty can easily upload video or record flipped modules, full lectures and other supporting videos, all of which is automatically published to the Canvas course. Mediasite’s viewership analytics show what video or video segments are watched by which students. Students will also have more flexible access to academic video. Highlights: WolfVision always brings new perspectives to classroom tech, and their vSolution Connect app is no exception. Also on display at EDUCAUSE was the VZ-C6, WolfVision's Ceiling Visualizer, an all-in-one multi-media presentation device. Mounted from the ceiling so you can keep your table space clear of equipment. Great for distance learning. Highlights: Room scheduling digital signage was a focus at the Visix booth where I got to see the popular 10- and 15-inch models. Whether you want to show room schedules or employ a fully-integrated office-style hoteling, the room sign line lets you schedule space from any location, any time. Room signs can be fed by a single scheduling application; the calendar is consistent and up-to-date everywhere, no matter who changes it or from where on campus. Margot Douaihy is the editorial director of AV Technology, Tech Manager Today, and EDUwire.